Entra nel mondo dei videogiochi e di Playstation 3. 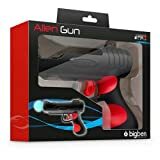 Insert your Playstation Move into the Alien Gun to enjoy a real shooting action. Real trigger that activates the trigger button on your Playstation Move.